We have collected a lot of trail maps from local parks over the years. We can never seem to find the right map when needed though so we started collecting the PDF files or JPG files of these maps and storing them here (map listing below ↓). We try to keep everything up to date but some of them might be slightly older than the current version. If you notice an outdated map, shoot us an email at leathermansloop@gmail.com and let us know which map is out of date — and where you found the newer one. Some of these maps are available at the Westchester County Parks website, the various land trust websites, or many town websites. Others are available at the NY/NJ Trail Conference website. Still others are only available as printouts at the preserve itself. And one of these maps is an original – not available any other place but here! Let us know if you have other parks (or better versions of the maps we have collected). We would like to add any Hudson Riverwalk maps and other parks that are local to you — but that others may not yet have come across. We have also started a project that we hope to expand — overlaying some of these trail maps onto a satellite image from Google maps. Click here to download a Photoshop file of this image so you can vary the transparency to see where they are. The actual maps used are listed below along with many others. We are working on a larger version of this and also a Yorktown version of this “mashup” and would like to eventually get all maps onto one file. The main entrance to Angle Fly Preserve is on Primrose Street, just 0.5 miles south of Reis Park in Somers. Another entrance is at Reis Park itself. The trail system in this park is around 10 miles of trails in this 650+ acre preserve. 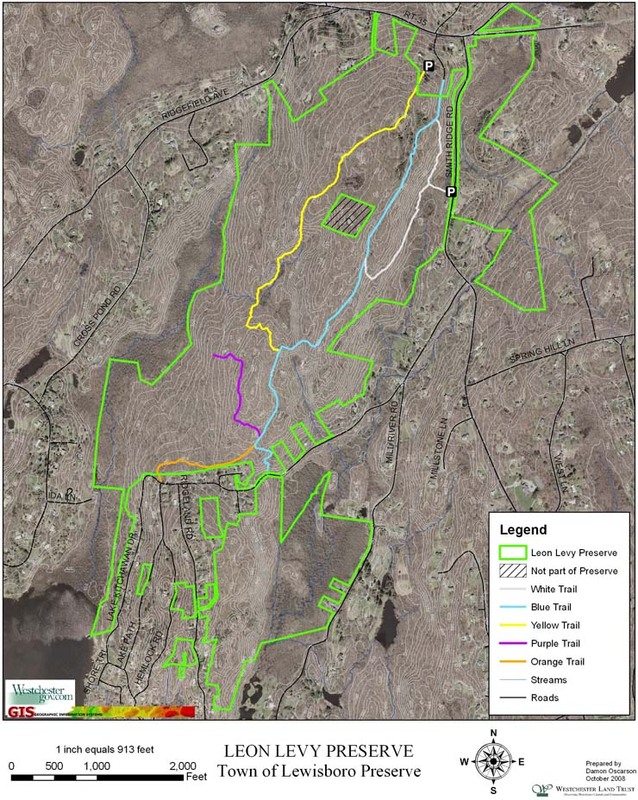 http://www.somerslandtrust.org/angle-fly-preserve/hiking (new trails and map updated February 2012). Blue Mountain Reservation is a 1,538-acre park in the northwest section of Westchester County. It was aquired in 1926. It features miles of trails for mountain biking, strolling and nature study, and offers challenging hikes to the tops of two large peaks, Mt. Spitzenberg and Blue Mountain. The Sportsman Center at Blue Mountain Reservation is a recreation facility offering target ranges. The 12-mile Briarcliff-Peekskill Trailway, an unpaved trail for hiking, is accessible from the Blue Mountain trail system. Linear trail system from Briarcliff to Peekskill. Goes through Teatown Park and other parks along the way. Main trailhead with parking is on Sheather Road in Mt Kisco/New Castle, NY. 125 acres in two parcels with connecting right of way trail. Total trail miles are around 2. 400+ acre Nature Conservancy preserve in Mt Kisco on Chestnut Ridge Road. Hawk watch overlook is visible from 684. Connects to Merestead County Park via BRLA trail link. Camp Smith is on the Hudson River near Peekskill, NY. Challenging trails with spectacular views of the Hudson River and Hudson Valley. Croton Point Park is on the Hudson River in Croton-on-Hudson, NY. Accessible via Metro North Hudson line from NYC and just off of Route 9. Multi use area including a seasonal beach, picnic areas, trails, and a Radio Controlled (RC) airplane designated area. FDR Park is a New York State Park in Yorktown, NY. It is a 200+ acre park with 6-7 miles of trails and many other facilities including picnic, pool, frisbee golf, and playgrounds. It is home of Mudders and Grunters, a 5 mile trail race "The Oldest Trail Race In Westchester" which attracts over 500 trail runners from the surrounding area at the end of March every year. Around 5 miles of hiking / mountain biking trails bordered by the Saw Mill Parkway and the Taconic Parkway in Pleasantville, NY. The trails wind through the many diverse habitats of this beautiful 431-acre park. This 200 acre park is in Yorktown, NY along the west side of the Taconic State Parkway just north of the Route 35 exit. It has around 3-4 miles of windy trails. The trails are connected via footbridge to the Woodlands Legacy Fields Park on the east side of the Taconic for another 3-4 miles of trails. The Yorktown Trailway also connects this trail system to Sylvan Glen Park, also in Yorktown. The park is on the site of a former quarry. Signs of quarry activity are in and around the granite knoll in the center of the park that gives it its name. Across the street from the bustling and scenic Hilltop Hanover Farm on the east side of Hanover Street in Yorktown is a 125-acre piece of wooded parkland known as the Hilltop Hanover Hiking Trails. The park is traversed by 3.5 miles of unpaved trails for hiking and nature study. Along the way see old farm stone walls, vernal ponds, rock outcrops and beautiful views. This park encompasses much of the eastern side of the Hudson River gorge. Totaling 7400 acres, it has many sections, all administered by the New York Office of Parks, Recreation and Historic Preservation. Many of these sections have dramatic scenery or history -- often both. The area was strategically important during the Revolutionary War, resulting in fortifications on both sides of the river, and provided the backdrop for several key events from that era. Trails in this park often include steep climbs and panoramic views of the Hudson River. Lasdon Park, Arboretum and Veterans Memorial is a magnificent 234 acre property in Somers/Katonah, NY consisting of woodlands, open grass meadows and formal gardens with flower and shrub specimens from all over the world. It has a small trail system and is across Route 35 from the new Angle Fly Preserve and across the Muscoot River from Muscoot Farm Park. 300+ acre preserve in South Salem, NY. Minimal parking is available on Route 123 just south of Route 35. The trailhead on Route 123 has room for one car and there is room for 2-3 other cars just north of the trailhead on the other side of Route 123. 200+ acre preserve with several separate parcels. Main trail system connects with Leonard Park in Mt Kisco behind the town pool (and frisbee golf course!). The other end of the trail exits on Sarles Street and crosses that street, connecting to a BRLA trail that connects to Merestead County Park. The trails in Merestead connect through to the Butler Preserve and across Sarles Street (via short BRLA link trail) is the trailhead to the Marsh Sanctuary trail system. Hiking trails are open daily 8 a.m. to dusk. As you explore this 2.3-mile system of trails, you’ll meander through woodlands, open fields and gardens that offer some of the most beautiful scenery in the northeast. Bear Mountain and the Hudson Highlands can be seen on a clear day in the west. The Eugene and Agnes Meyer Preserve is in Armonk and Mt. Kisco NY. It is around 400 acres with 6-7 miles of varied trails and terrain. The lower parcel is accessible from Oregon Rd in Armonk (parking for up to 3-4 cars). The upper parcel is connected to the lower parcel via Old Oregon Rd (abandoned, but still a trail). It is also accessible via parking on Sarles St in Mt Kisco and via Old Byram Lake Road (abandoned) in Mt. Kisco. 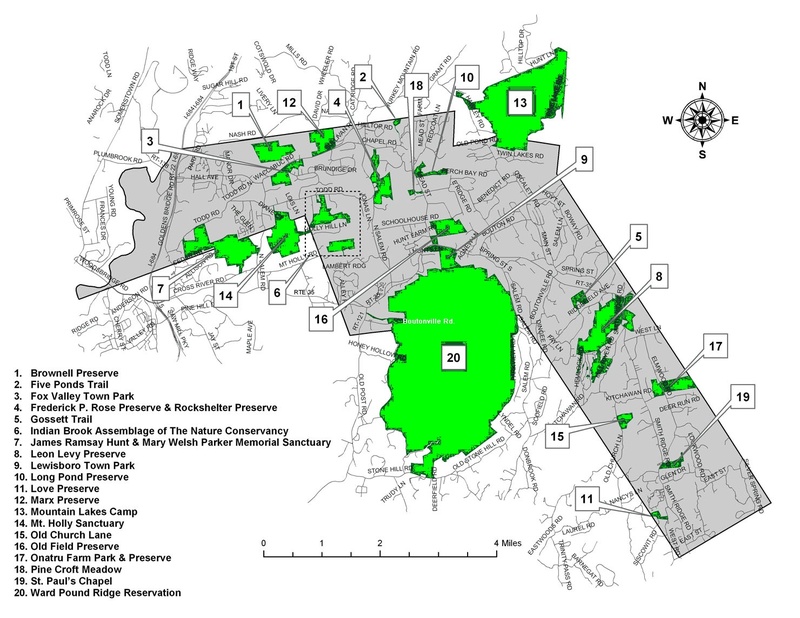 This is the official Nature Conservancy map of the preserve. The Eugene and Agnes Meyer Preserve is in Armonk and Mt. Kisco NY. It is around 400 acres with 6-7 miles of varied trails and terrain. The lower parcel is accessible from Oregon Rd in Armonk (parking for up to 3-4 cars). The upper parcel is connected to the lower parcel via Old Oregon Rd (abandoned, but still a trail). It is also accessible via parking on Sarles St in Mt Kisco and via Old Byram Lake Road (abandoned) in Mt. Kisco. Mountain Lakes Park is a 1,200+ acre park mostly in North Salem, NY with some acreage in South Salem, NY. 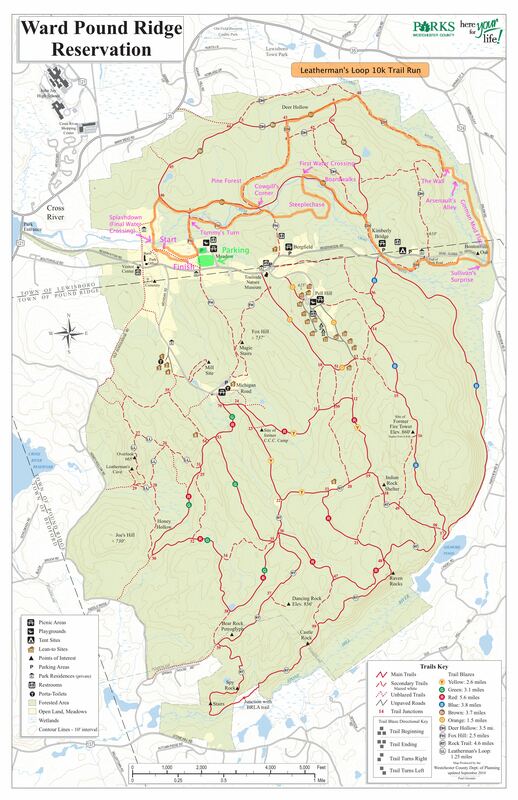 Its 8+ miles of trails connect with the Boy Scout Camp trails in adjoining Ridgefield, CT. Trails have spectacular overlooks viewing Lakes Waccabuc, Rippowam, and Truesdale. Sarah Bishops cave is accessible via trails at the park but is on private land. New October 2012 map shows new trails and connections which are a fantastic addition to this already scenic park. This 777 acre park is also a working farm. There are 6+ miles of trails in the forest and meadows behind the farm. There are stone walls, steep hills, cliffsides, and farm roads. 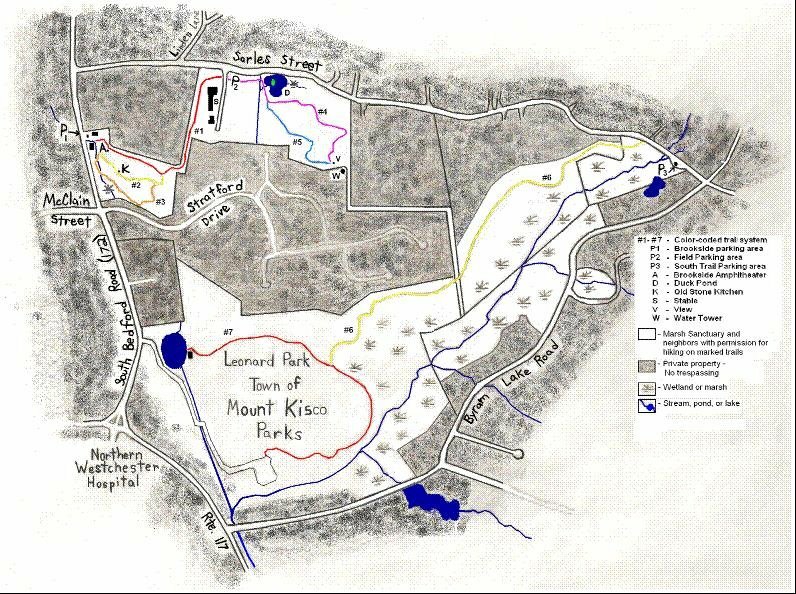 This park trail map was created by one of our runners and is currently better than the county provided trail map. It does have the "Run The Farm" 5 mile course marked on it though but it is a very useful map for hikers in Muscoot. A paved, multi-use path that spans north through the heart of Westchester for 22.1 miles to the Putnam County border. The Putnam Trailway is a paved bicycle/pedestrian path located primarily on right-of-way lands of the former Putnam Division of the New York Central Railroad. The “Old Put” as it was formerly referred to by commuters, provided freight and passenger service from 1881 to 1958 between the Bronx in New York City and Brewster in Putnam County. The Putnam Railroad once served 6 stations in Putnam County, some of which still stand today. Station stops included Brewster, Tilly Foster, Carmel, Crafts, Mahopac, Lake Mahopac and Baldwin Place. The Lake Mahopac station building is known today as the American Legion Post building on Bucks Hollow Road. The Preserve is characterized by 1600 acres of woodlands, meadows, and wetlands with 25 miles of soft carriage roads and a 24-acre lake ideal for walking, jogging, cross-country skiing, birdwatching and photography. Saxon Woods Park is a 700-acre property offering a variety of recreational facilities. A trail system connects the southern section to the upland wooded northern part of the park, characterized by mature hardwood forests. The trails are very popular with hikers, cross country skiers and horseback riders. The entire system extends along the Hutchinson River Parkway to Twin Lakes Park and north to Maple Moor Golf Course. It also links to the Leatherstocking Trail and Colonial Greenway and contains archeologically sensitive areas. The "Paine to Pain" Trail Half Marathon is run through this park as one of the many links in its 13.1 miles. A paved, multi-use trail 14.1 miles in length spanning central to southern Westchester. The Park’s 278-acres include a swimming pool complex, arboretum and two picnic areas. The remainder of the park is heavily wooded with a variety of hiking and mountain bike trails. This park is in Yorktown, NY and has 343 acres and over 6 miles of marked trails. Parts of the park are a former quarry and still shows signs of this activity. The trail map highlights some of the key points of interest. The trail system connects to the Yorktown Trailway which ties together the Granite Knolls Park and the Woodlands Legacy Fields park trail system (via footbridge across the Taconic Parkway). The NY/NJ Trail Conference and Teatown Lake Reservation completed construction of the TEATOWN-KITCHAWAN TRAIL in the fall of 2010. This 6.5-mile pathway connects Westchester County's Kitchawan Preserve to Teatown. It is significant in its being one of few trails in the area that runs east-west, rather than north-south. Also, the trail will cross some little-visited DEP (Dept. of Environmental Protection) watershed lands that provide magnificent vistas of the Hudson Hills and Highlands. This park covers a total of 875 acres including the 41-acre Teatown Lake, 50-acre Shadow Lake property, 59-acre Croft Open Space, Cliffdale Farm, streams, a scenic gorge, hardwood swamps, mixed forests, meadows, hemlock forests, and laurel groves. Teatown maintains fourteen trails that traverse nearly 15 miles, over diverse terrain and habitats. The trails range from easy/novice to moderately difficult. The trails connect to the Briarcliff Peekskill Trailway and the Croton Aqueduct Trail. Index to trail preserves in and around Lewisboro, NY including Ward Pound Ridge Reservation. 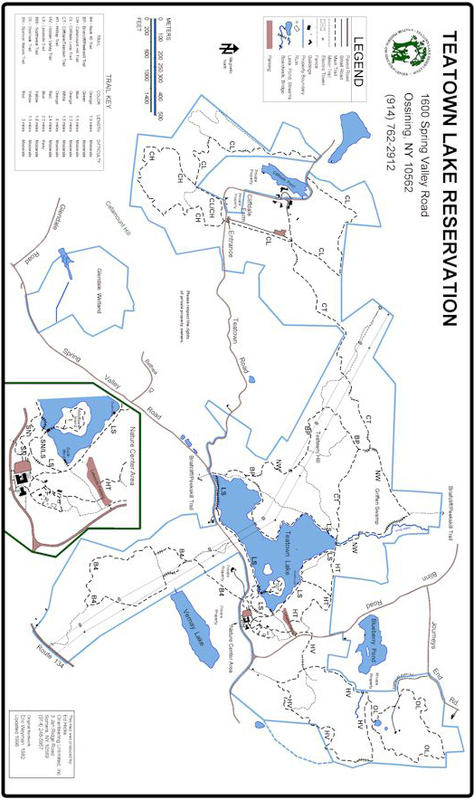 Full size trail map for the 4,300 acre Ward Pound Ridge Reservation. This version has the Leatherman's Loop 10k course marked. Over 650 acres off of Chestnut Ridge Road in Mt. Kisco with 7+ miles of trails. Parts of the preserve extend into Armonk NY. There are also access trails from Fox Lane Middle School off of Route 172. Across the highway is Butler Preserve with another 6+ miles of hilly trails. This map was created by one of our runners and has a 5.2 mile course marked in orange but can still be used by any hikers in the sancturary. Whippoorwhill Park is a 167 acre park in Chappaqua, NY. It has 3-4 miles of trails including a trail that has multiple tree specimens labeled and described. Some unmarked trails where old roadways existed. A nice small park. Link to New Castle website was down when posting this note (http://www.mynewcastle.org/index.php?option=com_content&view=article&id=80&Itemid=183). Link below has a nice description of this park (and other parks). This park in Yorktown, NY has 158 acres of land and is connected to the Granite Knolls Park via a footbridge crossing the Taconic State Parkway. There are two baseball fields and a turf multi-sport football/soccer/lacrosse field. During the spring, summer, and fall they are heavily used and parking can be tight. During the winter the lower gate is usually closed. This makes trailhead access difficult. The trails are hilly and bisected by the Hunter Brook. Some trails have new footbridges crossing this stream. Total trail mileage is around 3-4 miles. Add in the Granite Knolls park to get 7-8 miles. The footbridge also connects to the Yorktown Trailway which connects to the south with Sylvan Glen Park which has an additional 5+ miles of trails not including the mile or so on the Yorktown Trailway connector trail.